고정 공용 IP 주소를 사용하여 가상 머신을 만들 수 있습니다.You can create a virtual machine with a static public IP address. 공용 IP 주소를 사용하면 인터넷에서 가상 머신과 통신할 수 있습니다.A public IP address enables you to communicate to a virtual machine from the internet. 동적 주소 대신 고정 공용 IP 주소를 할당하여 주소가 변경되지 않도록 합니다.Assign a static public IP address, rather than a dynamic address, to ensure that the address never changes. 고정 공용 IP 주소에 대해 자세히 알아봅니다.Learn more about static public IP addresses. 기존 가상 머신에 할당된 공용 IP 주소를 동적에서 고정으로 변경하거나 사설 IP 주소를 사용하려면 IP 주소 추가, 변경 또는 제거를 참조하세요.To change a public IP address assigned to an existing virtual machine from dynamic to static, or to work with private IP addresses, see Add, change, or remove IP addresses. 공용 IP 주소에는 명목 요금이 부과되며, 구독당 사용할 수 있는 공용 IP 주소의 수에 제한이 있습니다.Public IP addresses have a nominal charge, and there is a limit to the number of public IP addresses that you can use per subscription. https://portal.azure.com 에서 Azure Portal에 로그인합니다.Sign in to the Azure portal at https://portal.azure.com. Azure Portal의 왼쪽 위 모서리에 있는 + 리소스 만들기를 선택합니다.Select + Create a resource found on the upper, left corner of the Azure portal. 계산을 선택한 다음, Windows Server 2016 VM 또는 다른 운영 체제를 선택합니다.Select Compute, and then select Windows Server 2016 VM, or another operating system of your choosing. 사용자 이름User name 선택한 사용자 이름을 입력합니다.Enter a user name of your choosing. 암호Password 선택한 암호를 입력합니다.Enter a password of your choosing. 암호는 12자 이상이어야 하며 정의된 복잡성 요구 사항을 충족해야 합니다.The password must be at least 12 characters long and meet the defined complexity requirements. 구독Subscription 구독을 선택합니다.Select your subscription. 리소스 그룹Resource group 기존 항목 사용을 선택하고, myResourceGroup을 선택합니다.Select Use existing and select myResourceGroup. VM에 대한 크기를 선택한 다음, 선택을 선택합니다.Select a size for the VM and then select Select. 설정 아래에서 공용 IP 주소를 선택합니다.Under Settings, select Public IP address. 공용 IP 주소가 표준 SKU여야 하는 경우 SKU 아래에서 표준을 선택합니다.If the public IP address must be a standard SKU, select Standard under SKU. 공용 IP 주소 SKU에 대해 자세히 알아봅니다.Learn more about Public IP address SKUs. 가상 머신이 공용 Azure Load Balancer의 백 엔드 풀에 추가되는 경우 가상 머신 공용 IP 주소의 SKU는 부하 분산 장치의 공용 IP 주소의 SKU와 일치해야 합니다.If the virtual machine will be added to the back-end pool of a public Azure Load Balancer, the SKU of the virtual machine's public IP address must match the SKU of the load balancer's public IP address. 자세한 내용은 Azure Load Balancer를 참조하세요.For details, see Azure Load Balancer. 공용 인바운드 포트 선택 아래에서 포트를 선택하거나 선택하지 않습니다.Select a port, or no ports under Select public inbound ports. 인터넷에서 Windows Server 가상 머신에 원격 액세스할 수 있도록 포털 3389가 선택됩니다.Portal 3389 is selected, to enable remote access to the Windows Server virtual machine from the internet. 인터넷에서 포트 3389를 여는 것은 프로덕션 워크로드에 권장되지 않습니다.Opening port 3389 from the internet is not recommended for production workloads. 나머지 기본 설정을 수락하고 확인을 선택합니다.Accept the remaining default settings and select OK.
요약 페이지에서 만들기를 선택합니다.On the Summary page, select Create. 가상 머신을 배포하는 데 몇 분 정도 걸립니다.The virtual machine takes a few minutes to deploy. 가상 머신이 배포되면 포털의 맨 위에 있는 검색 상자에 myPublicIpAddress를 입력합니다.Once the virtual machine is deployed, enter myPublicIpAddress in the search box at the top of the portal. 검색 결과에 myPublicIpAddress가 표시되면 선택합니다.When myPublicIpAddress appears in the search results, select it. 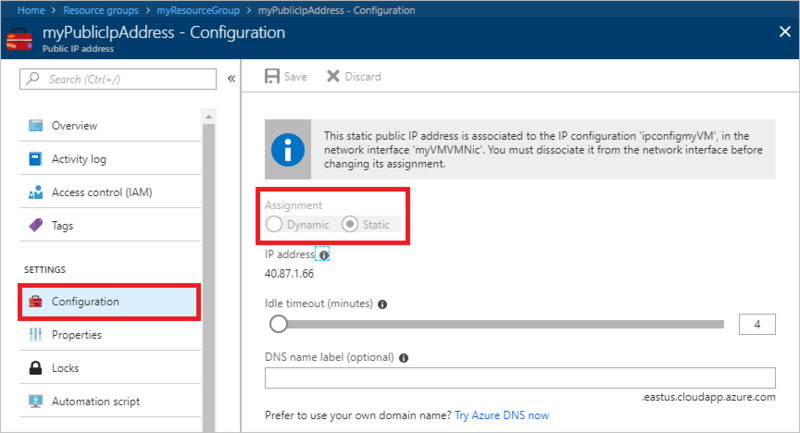 Azure는 가상 머신을 만든 지역에서 사용되는 주소에서 공용 IP 주소를 할당했습니다.Azure assigned a public IP address from addresses used in the region you created the virtual machine in. Azure 공용, US 정부, 중국 및 독일 클라우드의 범위(접두사) 목록을 다운로드할 수 있습니다.You can download the list of ranges (prefixes) for the Azure Public, US government, China, and Germany clouds. 구성을 선택하여 할당이 고정인지 확인합니다.Select Configuration to confirm that the assignment is Static. 가상 머신의 운영 체제 내에서 IP 주소 설정을 수정하지 마십시오.Do not modify the IP address settings within the virtual machine's operating system. 운영 체제는 Azure 공용 IP 주소를 인식하지 않습니다.The operating system is unaware of Azure public IP addresses. 운영 체제에 사설 IP 주소 설정을 추가할 수 있지만 필요하지 않는 한 그리고 운영 체제에 사설 IP 주소 추가를 읽기 전까지 추가하지 않는 것이 좋습니다.Though you can add private IP address settings to the operating system, we recommend not doing so unless necessary, and not until after reading Add a private IP address to an operating system. 포털 맨 위에 있는 검색 상자에 myResourceGroup을 입력합니다.Enter myResourceGroup in the Search box at the top of the portal. 검색 결과에 myResourceGroup이 보이면 선택합니다.When you see myResourceGroup in the search results, select it. 리소스 그룹 삭제를 선택합니다.Select Delete resource group. 리소스 그룹 이름 입력: 에 myResourceGroup을 입력하고 삭제를 선택합니다.Enter myResourceGroup for TYPE THE RESOURCE GROUP NAME: and select Delete.